I don’t know if they still do it, or if this was just an Iowa thing, but at Halloween school kids were encouraged to sign pledges instead of doing “Tricks”. As a gift for signing the pledge, kids could attend a dance (over 14) or take in a free movie (under 14) which was usually some really bad horror flick. 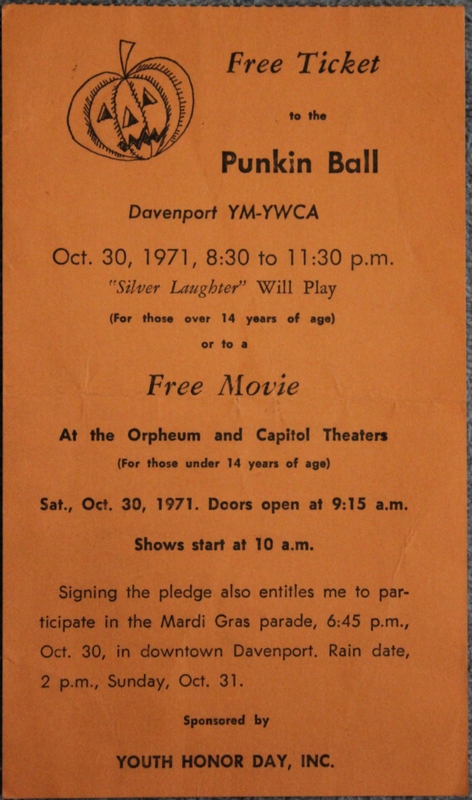 In 1971, the Silver Laughter lineup, which probably consisted of Jon and Kim Ludtke, Steve Elliott, Denny Walton and John Carstensen, played the Punkin Ball in Davenport.